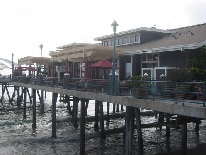 Kincaid’s Redondo Beach sits atop the Pier and offers stunning ocean views. The restaurant has an outdoor patio which is perfect for lunch or a warm day. The restaurant serves seafood and steak in a cozy relaxed atmosphere. Happy Hour: Daily 3pm-6:30pm and 9pm-close. Our bisque and chowder are finished tableside.